Learning NEXT: Common Core: "Weebles wobble but they don't fall down"
Common Core: "Weebles wobble but they don't fall down"
I've been at ASCD this weekend. It's a fairly big conference for educators. As is reasonable, there has been considerable conversation about assessment and, of course, Common Core. Books and assorted banners are emblazoned with the words "Common Core Aligned," which would be all very well and good if you could trust that. But don't trust that. Test it. When someone says the content is aligned with Common Core, you want to be sure that it reflects the kind of assessments OR the kind of thinking students will need to do for Common Core assessments. Don't know what that means? Go to the Dana Center CCSS Toolbox website, click on RESOURCES FOR IMPLEMENTATION, then the PARCC Prototypic Project. Start with elementary school tasks. If any of the assessments look like those assessments or start to work towards the kind of thinking students will have to do to complete those assessments, the product is on the right track. Just for kicks, though, textbook content can't be aligned with Common Core. If you look at the Anchor Standards for Reading, which are to the right, you'll see that these are skills students need to have. These are skills that are useful in any content area, in any grade. These are skills that might prove to be pretty useful for any college kid, and probably come in pretty handy for most folks in the work place. 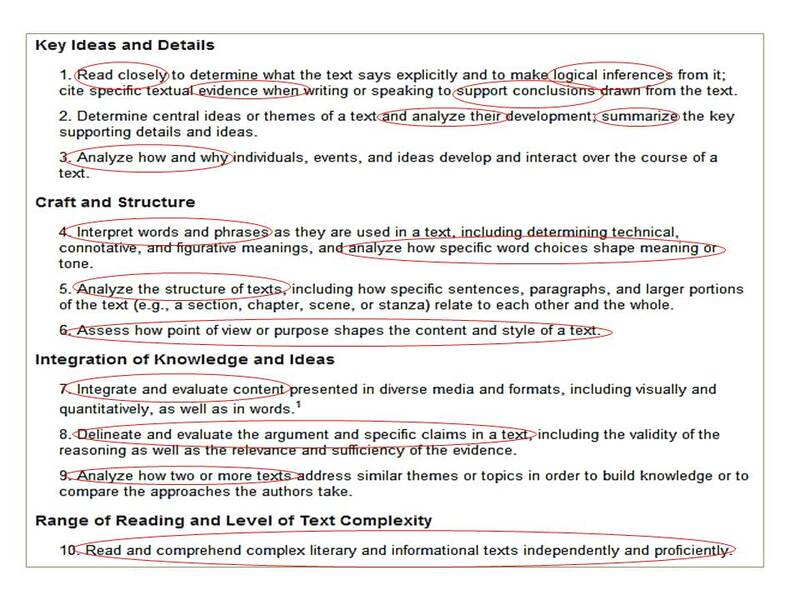 And if you look at the actual standards themselves, you'll see this very same structure: key ideas and details, craft and structure, integration of knowledge and ideas, and range of reading and level of text complexity. 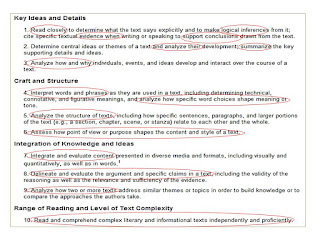 If you look closely at the Anchor Standards for Reading, you'll also see how each of the items in each section (identified by a recognizable text feature of a subheading or subtitle, stuff kids are encouraged to learn) reinforces the idea or intent of that subheading. The more attention Common Core gets, the more hits it is starting to take. The closer we get to Fall 2014, the more administrators and teachers who feel uninformed and unprepared are starting to panic. Lots of blogs, lots of inflammatory rhetoric, lots of knee-jerk reactions, lots of failure to, um, think critically or speak or write with evidence. Something that Common Core supports and which the standards are geared to help students and teachers accomplish. Deep breaths, people. It's not that hard. Not really. Go ahead and smack at the weebles a few time to release some of that tension, anxiety, and/or frustration, but just like the weebles, stay up and keep on going. To all educators who are feeling uninformed and unprepared, you can do this. Plenty of folks out there who can help you manage and figure out what you need to do. But don't let them frighten you or talk you into unpacking or unwrapping or deconstructing all of the standards as that will be a waste of your time. It won't be a walk in the park, but it's not the Tower of Terror either.